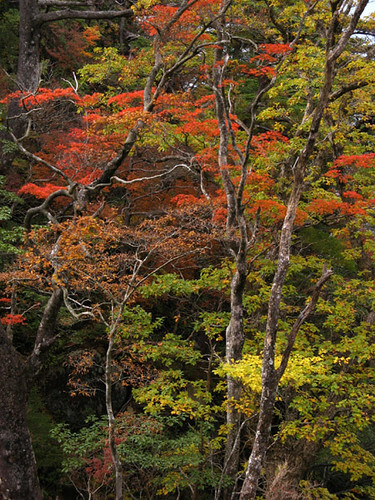 While the pointer is on the map of the Central Kyushu Mountains, it seems a good opportunity to log the classic hiking on Mount Ichifusa, where we ventured the other weekend, bringing along a couple of other hikers to view the season’s colorful foliage. Located just south of Mt. 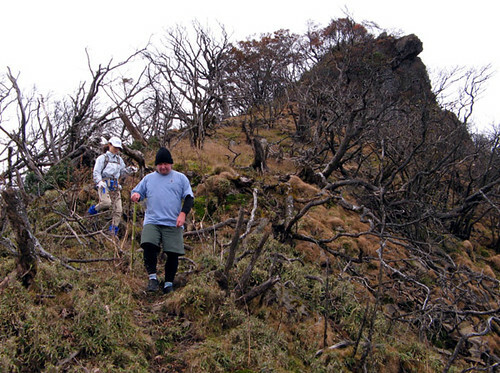 Eshiro on the Kumamoto-Miyazaki prefectural boundary, at 1721m it is one of the tallest peaks of the region. Mt. 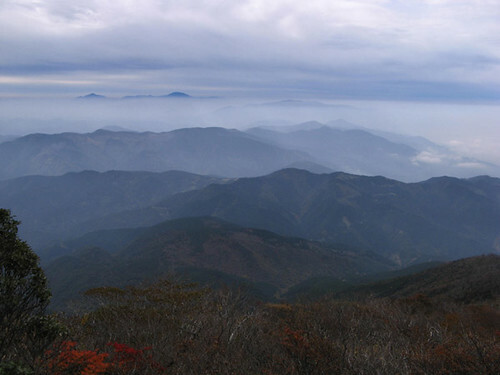 Ichifusa stands slightly apart from the otherwise densely packed Central Mountains, separated from its neighbors by deep valleys, it offers an airy view from its summit that is not to be missed by any half-serious hiker. 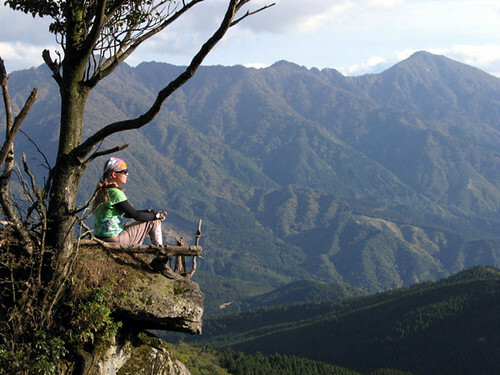 Combine this with the fact that much of the middle and upper reaches of the mountains are covered with natural, undisturbed forest, and a relatively easy access from the nearby city of Hitoyoshi, it is no wonder Ichifusa is one of the most sought after summits in central Kyushu. Better than average satellite land cover images, courtesy of JAXA, the Japanese Space Agency, have recently become available, enabling us to create this simulated 3-D view (as well as that of Mt. 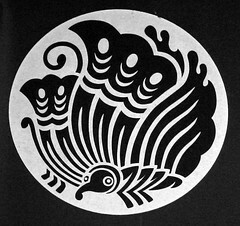 Eshiro in the previous entry). The extensive marks of human interference, but also the extent of these mountains’ remaining natural forests, are exquisitely visible in these images. Hiking trails are marked in yellow, dirt roads orange, paved roads black and red according to quality; data is from our own GPS surveying. In this view, the right-most trail is the standard, easiest and most popular route to the summit. Two trails lead down from the excellent and challenging cockscomb ridge traverse. One more trail descends on the Miyazaki side toward a trailhead in Nishimera village. 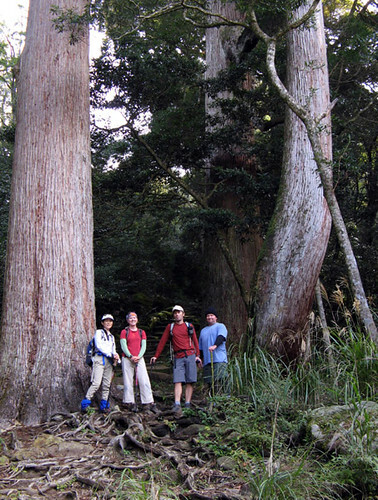 Large cedars line the initial part of the trail up to Ichifusa Shrine. 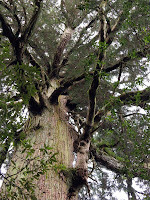 Because the trees along the shrine trail are considered sacred, they are allowed to grow to full size. A view to the south from the summit. The distant Kirishima group of volcanoes can be seen above a layer of haze. The relative closeness of the trailheads to the summit of Mt. 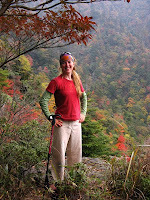 Ichifusa should not mislead prospective hikers into thinking it is a walk in the park. Although the standard route is only 3.8km long, it is steep most of the way, rising 1130m from the traihead at 590m to the 1721m high summit. (An alternative start exists from a higher trailhead at 790m, which also makes the hike about 800m shorter, but the small parking lot there tends to fill quickly on busy weekend mornings.) Any way you slice it, the ascent will be tiring and take about 1.5-3 hours. 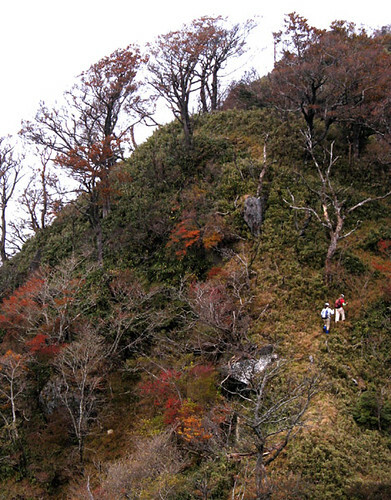 After climbing to the comfortably wide summit and enjoying the views and lunch there, experienced hikers can traverse a well-known, exposed and narrow ridge to Futatsu-Iwa (literally Two Rocks), a 1671m sub-summit located to the north-east. 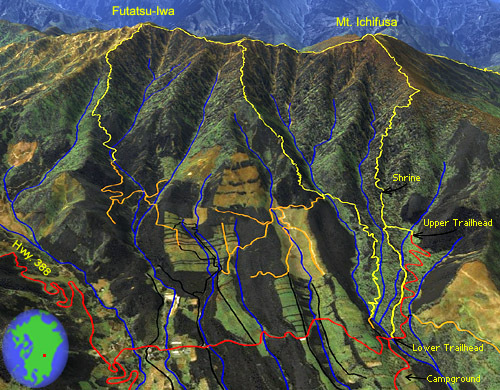 The 2.8km traverse involves a number of short but steep ups and downs; the former add up to 300m of vertical gain. Rope-equipped rope scrambles, slippery grass underfoot and the odd bit of third-classing over steep, loose landslides, which conspicuously cover this side of the mountain, will be encountered and the traverse can easily take 2-3 hours. From Futatsu-Iwa a trail descends 2.5km to an elevation of 940m from where dirt and paved roads can be followed for another 4.8km back to the original trailhead. Carl and Kazumi, our companion hikers for the day, watch their footing on the slippery ridgeline trail towards Futatsu-Iwa. The well known Futatsu-Iwa circuit has a lesser known, but nevertheless interesting variation. Just north of point 1642m, near the halfway point of the ridge, a branch trail descends along a steep ridge to the west. This time around, we decided to explore it on our descent from the mountain. And although by leaving the main ridge at this point, one avoids much of its difficulties and challenges, going this way has the advantage of returning straight back to the original trailhead, thus obviating the long walk on the roads. This variation is therefore considerably easier and takes perhaps two hours less time to complete, while still giving a taste of what the ridge is like. We recommend it to those who don’t want to return via the standard route but think the full circuit might be too scary or tiring. The descent itself was surprisingly delightful, taking us through some of the best fall scenery of the whole hike. It was also well marked and reasonably easy to walk. Kazumi and Leanne negotiate the steep ups and downs of the long ridge. Pretty fall scenery along the alternative descent route. By now most of the leaves have fallen on Mt. Ichifusa, but the mountain remains interesting during any season. The summit and ridge area is much more exposed to winter storms than its lower reaches, and if one comes at the right time, one can enjoy spectacular rime ice and frost scenery near the summit while the approaches remain comfortably snow free. Seeing the snow-capped mountain from below is also an unforgettable scene. Such views can be seen from the village of Mizukami nestled just below the mountain, where natural hot spring baths await the returning hiker. 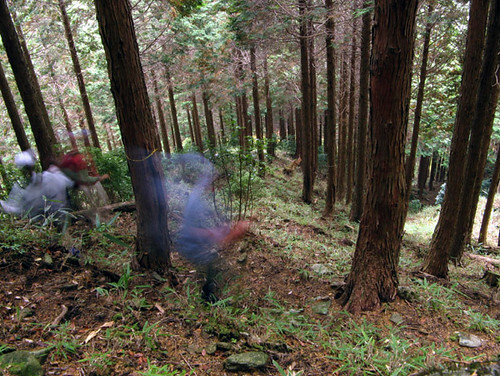 Descending down steep slopes through planted forest on the lower reaches of the mountain. 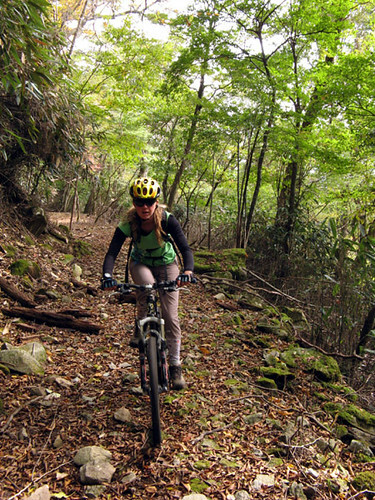 In our corner of Japan, mountain biking as such is virtually unknown. 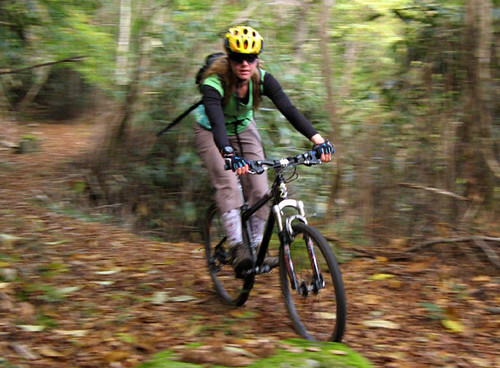 It follows that MTB-specific trail building and/or maintenance is also basically nonexistent. 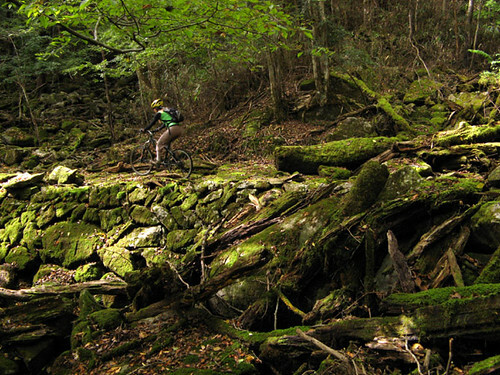 Nevertheless, in a mountainous yet populated place like Kyushu, with some effort, good riding can be found. 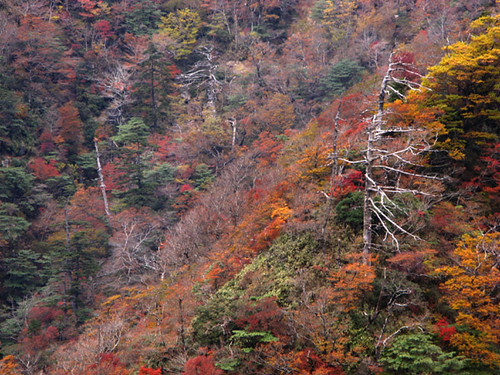 One such place is Eshiro-yama, a mountain on the spine of Kyushu near the small city of Hitoyoshi. Last year, while surveying the hiking trails through the beautiful, protected natural forest that exists on the upper parts of this and other nearby mountains, we chanced on one trail that showed some MTB potential. This year, as the weather finally cooled down towards the end of October, we finally set out to ride it in its entirety. The verdict: it’s a good one! Admiring a mature stand of pine trees on the approach. A part of the climbing section of the circuit leads up logging roads through planted forests. 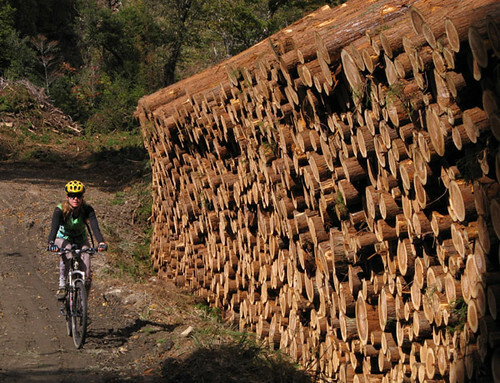 Here, Leanne passes a curiously stacked pile of lumber. 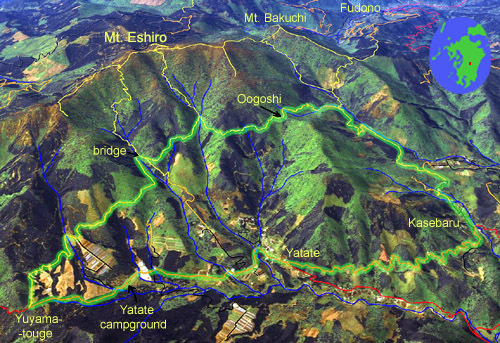 The course is best run as a counterclockwise, 16km circuit starting and ending at the Yatate Campground, in Shiiba Village, Miyazaki Prefecture, just across the prefectural boundary with Kumamoto Prefecture. The campground is at an altitude of 900m; except during the short summer season it is utterly deserted. The initial 5.2km of gently descending, paved, yet narrow and twisty road serve as a reasonable warm-up. 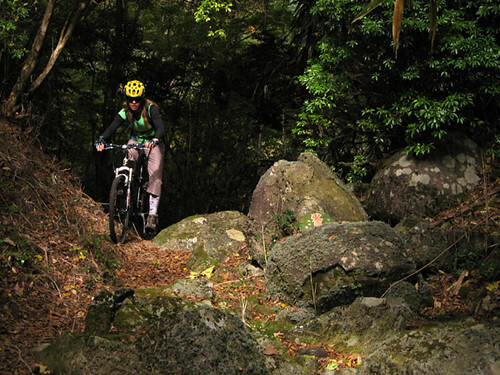 The climbing then starts in earnest, following small, mostly unpaved roads that climb up into the mountain for 4.3km past fields and planted forests. The gradient increases even as road conditions worsen; the last 600m is a grade of nearly 20% on a bouldery 4x4 track that requires advanced skill and fitness to negotiate in the saddle. 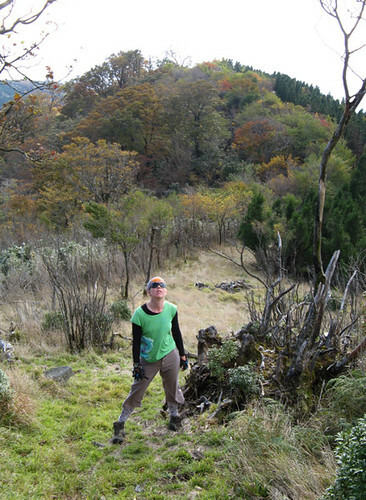 Finally, a 1240m high point called Oogoshi is reached, and the reward for the arduous climbing can be reaped: 2.6km of delightful, gently descending singletrack through the deep woods. In one place, one can get a great view to the south of the imposing 1721m tall Mt. Ichifusa, and further along two excellent hiking trails lead up through rare virgin forest to the summit of the 1609m Mt. Eshiro, from where unrestricted views can be had over much of the central Kyushu highlands. Soon after the second trail junction the singletrack crosses a makeshift bridge and widens into a gravelly road. 2.8km of enjoyable downhill riding then lead to Yuyama Pass, from where another 1km of gentle descent on pavement leads one back to the campground. Rich shades of green and dappled sunlight are our companions on this trail through the deep forest. 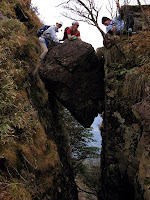 The trail was reinforced with stones when built into the steep mountainside a long time ago. 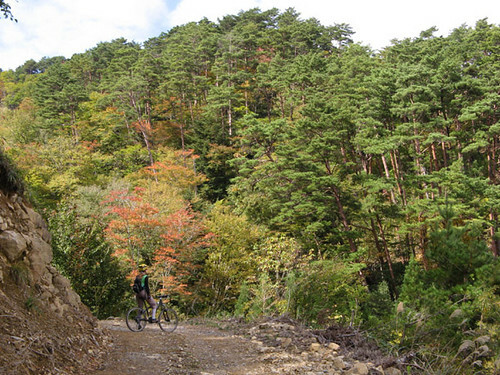 Such pleasing and natural trail building is a rare find in Japan these days. Mostly, the trail is an easy run but here and there mildly technical sections such as this one make for a fun diversion. The trail begins to descend a bit more steeply in the final part of the singletrack section, which can be taken at speed. Because there are hardly any mountain bikers in the rural parts of this country, we enjoy nearly complete MTB freedom here. There are no signs prohibiting bikes on hiking trails or logging roads, and negative feelings from hikers or others are extremely unlikely. Besides, complaining is so very un-Japanese. Nevertheless, we do exercise certain cautions. As much as we can we ride gently on the trails. Because we always have Mondays off work, we preferentially use these to ride, as there are very few hikers. 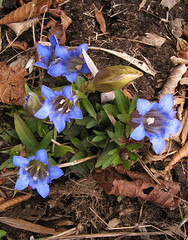 We avoid the short busy periods such as the fall colors viewing season or the flowering of some local plant, about which the locals can get pretty crazy. Using this stratagem, so far we’ve met exactly one person on the trails while biking; his reaction was to snap some pictures of us with his fancy digital camera, as if we were some rare form of wildlife. This being the prevailing attitude, it is unlikely that the over-use problems MTB faces many other countries will surface here anytime soon. But we still encourage anyone who might follow our blog into the wilderness to respect the spirit of minimal impact on nature and keep a low profile as we always do. Nearing the summit of Mt. Eshiro on foot. Hiking through the well-preserved natural forest here makes for a pleasant excursion on its own. Leanne takes a break during a survey of the summit ridge of Mt. Eshiro. 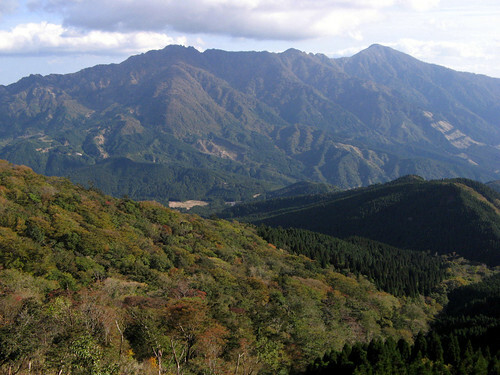 In the background is Mt Ichifusa with its long, high horizontal ridge draped in natural forest.